UI-View is one of the most popular APRS client applications available. It can be downloaded from the UI-View web page. Unfortunately Roger Barker (G4IDE), the author of UI-View, became a silent key in September 2004. At his request, the source code for the program was destroyed, making impossible changes or updates to the final release (Ver. 2.03) of the program. The program, as distributed, is now living in "suspended animation" with an increasing number of defaults and settings becoming outdated. Fortunately, many of these can be changed after the initial install. The steps below detail how to best configure UI-View to work in the VK APRS network effectively. 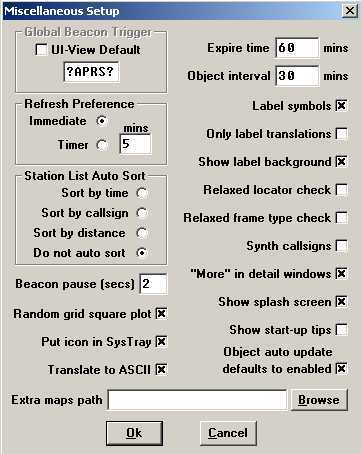 There have been numerous changes and updates to the APRS symbol set since UI-View became "frozen". 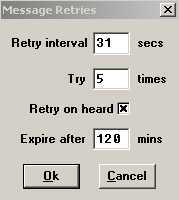 Fortunately, the APRS symbols used by UI-View are contained in a pair of Windows BMP graphics files that can be easily replaced (overwritten) after the program is installed. Replacement current symbol sets for UI-View are located here: Revised APRS Symbol Set . To set up your station details select Setup / Station Setup and fill in the dialog box based on the information below. For those who want to use the internet connection (APRS-IS) to send & receive APRS data instead of RF, change the Beacon interval / Fixed setting from 45 to 0 and the Beacon interval / Internet setting from 0 to 45. Like most APRS applications, UI-View requires that latitude/longitude entries for positions be expressed in Degrees, Minutes and hundredths of Minutes. You cannot use Degrees-Minutes-Seconds or Degrees and decimal Degrees. Correct configuration for VK connections to APRS-IS (the internet) for UI-View is as follows. 1. Select Setup / APRS Server Setup. 5. Click on the small box on the left of the entry you added. A small tick will appear in the box. To remove a server entry click on the entry and hit the [Delete] key. You may wish to delete all the un-ticked server entries. Since the APRS-IS contains the entire global APRS traffic, we must use a FILTER to restrict what you actually recieve. This filter is set in the "Extra log on text" box, and is structured by using the word filter followed by one or more filter definitions. If you connect to port 14580 of a server but do not set a filter, the server will not send you any data until you set a valid filter. 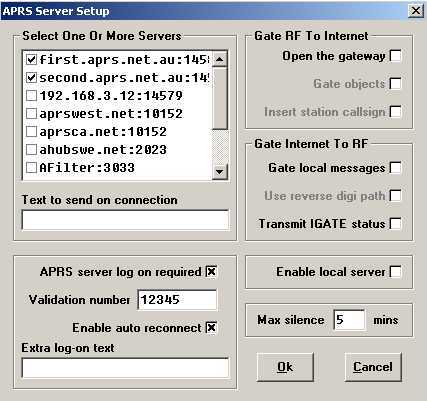 Miscellaneous Settings are required for APRS network cycle timing, Station Queries and other client behaviour. Select Setup / Miscellaneous and enter the settings as show below. 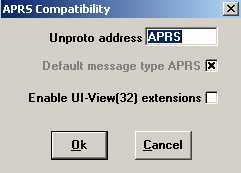 UI-View uses some special message formats that are not complient with the APRS protocol specifications. Turning these extensions off makes UI-View more compatible with other APRS applications. Select Setup / APRS Compatibility and enter all settings as show below. Messaging Settings need to be adjusted from the defaults to ensure that APRS Messaging can be sent and recieved effectively. Set the values for all fields as shown below. To aid in message Acknowledgements getting back to the message sender reliably, make sure that the "Use Default Path for Acks" option is checked under the Messages / Options menu. After you have configured the main parameters in UI-View you may wish to connect APRS-IS. To do this select Action / Connect to APRS Server. 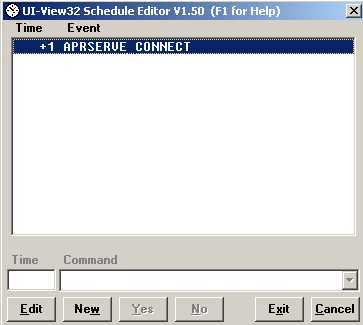 UI-View can be enabled to connect to APRS-IS automatically using the Schedule Editor which can be run from the Files menu. In the Schedule Editor, click 'New', select APRSERVE_CONNECT from the pull down menu in the Command box, type '+1' in the Time box then click 'Yes'. This will connect UI-View Client to APRS-IS 3 minutes after it has started.